ROCHESTER, Minn. — Mindfulness may be associated with fewer menopausal symptoms for women, according to a Mayo Clinic study recently published in Climacteric: The Journal of the International Menopause Society. Researchers discovered that being mindful may be especially helpful for menopausal women struggling with irritability, anxiety and depression. Mindfulness involves focusing attention on the present moment, and observing thoughts and sensations without judgment. Prior research has shown practicing mindfulness can reduce stress and improve quality of life. Every day, an estimated 6,000 women in the U.S. reach menopause. By 2020, the number of women age 55 and older is expected to top 46 million. A woman is considered to be in menopause if she has gone one year without a menstrual cycle. Commonly experienced symptoms of menopause can include hot flashes, night sweats, vaginal dryness and mood changes. The study involved 1,744 women ages 40 to 65 who received care at Mayo Clinic's Women's Health Clinic in Rochester between Jan. 1, 2015, and Dec. 31, 2016. Participants completed questionnaires that rated their menopausal symptoms, perceived level of stress and mindfulness. Researchers found women with higher mindfulness scores had fewer menopausal symptoms. The higher a woman's perceived level of stress, the greater the link between higher mindfulness and reduced menopausal symptoms. One surprising outcome of the study is that higher mindfulness scores were not associated with lower hot flash and night sweat symptom scores, Dr. Sood says. One theory as to why is that the amount of distress experienced from night sweats and hot flashes may have more to do with individual personality traits rather than the symptoms themselves. An exciting finding in the study, according to Dr. Sood, was the association of higher mindfulness scores and lower symptom scores for irritability, depression and anxiety in middle-aged menopausal women. 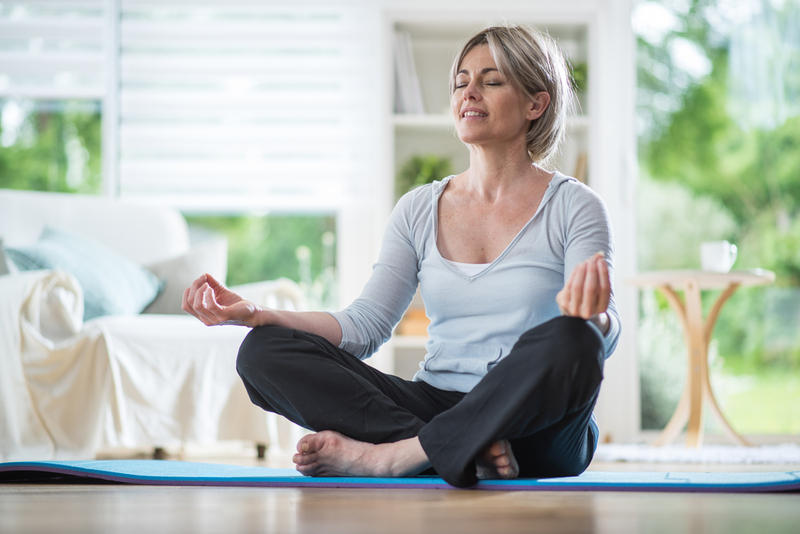 “While more studies need to be done, doctors can consider discussing mindfulness as a potential treatment option for menopausal women,” Dr. Sood says. Fortunately, mindfulness is a skill that can be learned. Co-authors of the study are Carol Kuhle, D.O. ; Ekta Kapoor, M.B.B.S. ; Jacqueline Thielen, M.D. ; Karla Frohmader Hilsaca, Ph.D.; Kristin Mara; and Stephanie Faubion, M.D. — all from Mayo Clinic.